Here’s one for students of values. 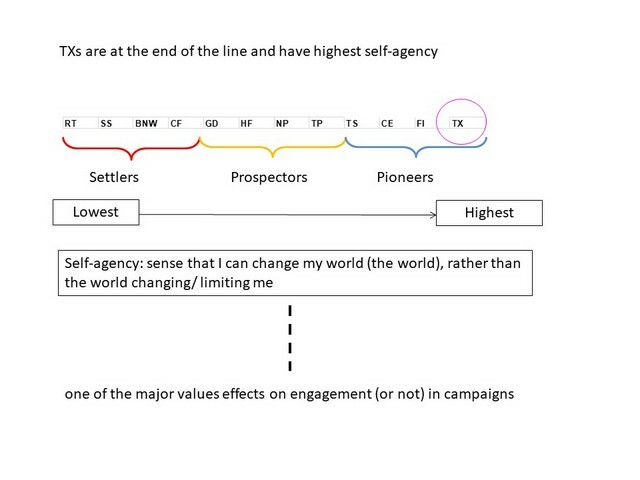 ‘Self-agency’, the sense that you can change the world rather than it limiting or changing you, increases as, and if, people ‘transition’ through the sequence of Values Modes. 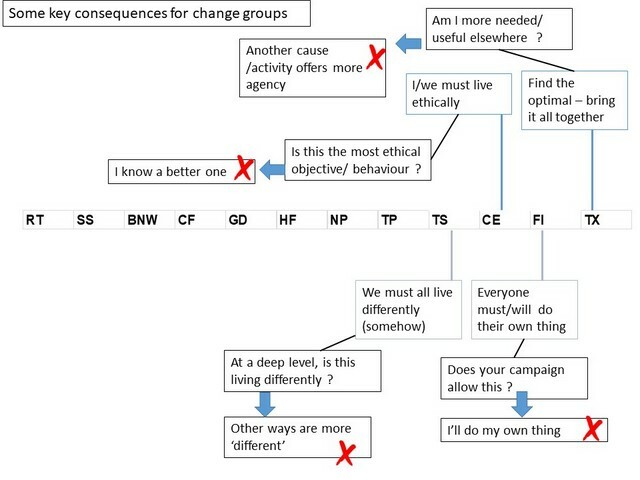 As a result, any campaign ask or offer which is framed as about changing ‘big stuff’, and or complicated things in open or unspecified ways, and in which it is not clear whether it can or will succeed, tends only to attract and retain people with a high sense of self-agency. 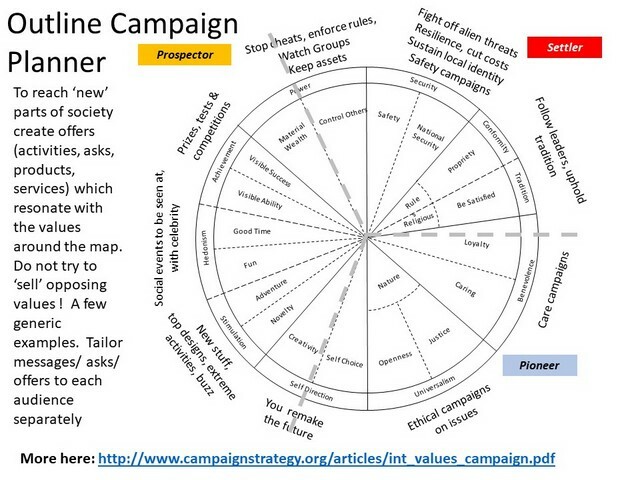 This doesn’t just apply to things labelled ‘campaigns’ but to any endeavour with these qualities. 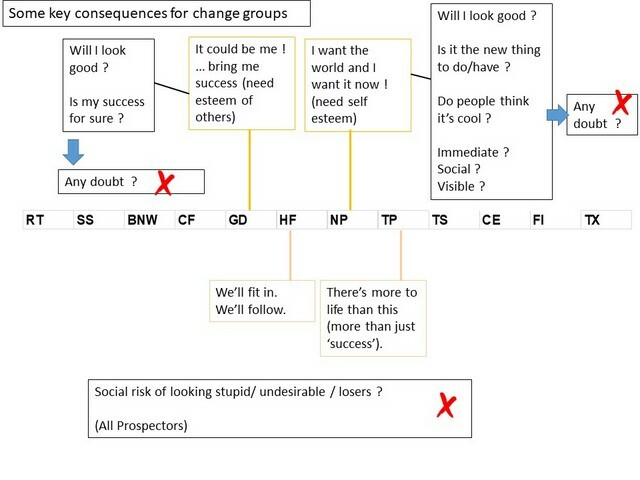 So for instance I often talk to groups of people undertaking courses with the Cambridge Institute of Sustainability Leadership and because that’s largely a self-selecting segment who have chosen to try a career in the uncertain and big-picture world of ‘sustainability’, they tend to be heavily weighted to the ‘TX’ or ‘Transcender’ Values Mode. 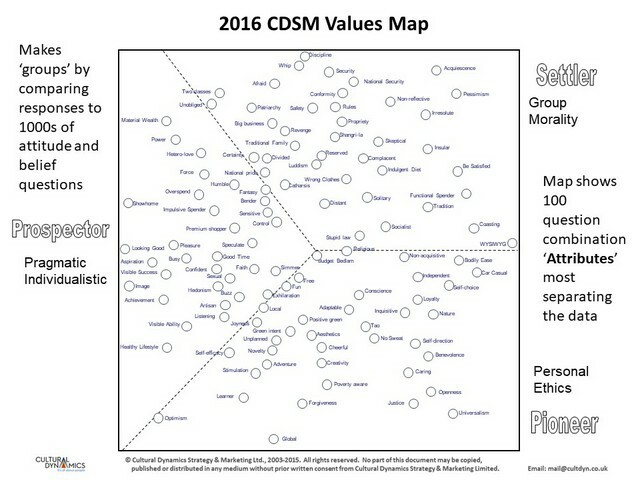 Some campaign NGOs we (CDSM and myself) have surveyed, are over 90% TX among the staff, and 60% or more among supporters even though these are as few as 10% in the general population (it varies internationally). Which has a lot of pros and cons. Here’s a slide set on how it happens, and below is a bit of an explanation. 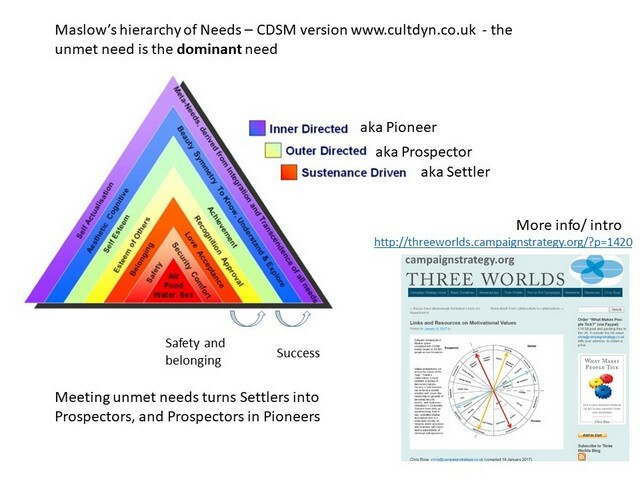 Although the researchers behind the model did not start with an intention to test or investigate Maslow’s theory of unmet needs, by mapping the results of asking thousands of people thousands of question, over decades, about their attitudes and beliefs, it does seem to validate Maslow’s basic proposition of a hierarchy or sequence of emotional and social needs. 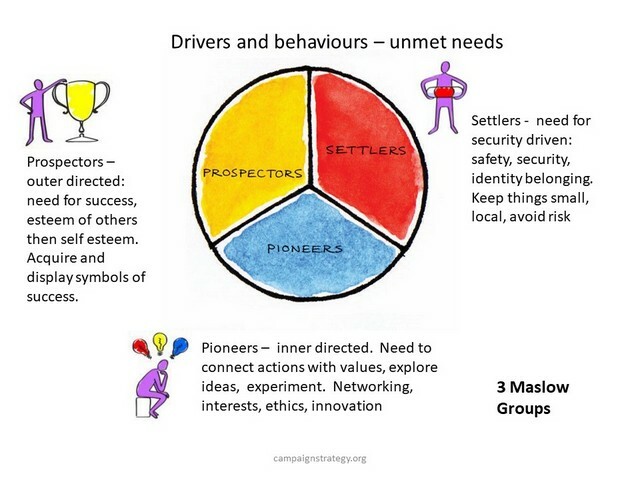 In essence, we start out in life with an unmet need for safety, security and identity (Settlers), and if that’s fully met we transition to become Prospectors with dominant unmet needs of esteem of others and then self-esteem, and if those are fully met we become Pioneers, with needs for ethical clarity and then ethical complexity. See links and resources here. CDSM calls these Maslow Groups. 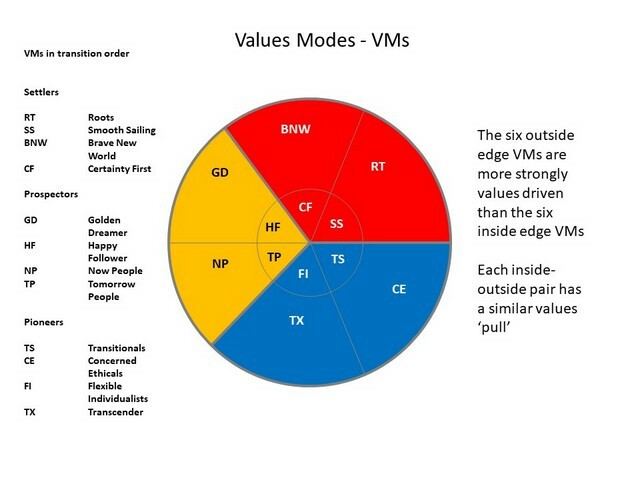 CDSM breaks these down into 12 ‘Values Modes’ (VMs) which are more cohesive and discrete values sets. The gist of their outlooks on life are shown above (outer edge six only). See links at the homepage to more detailed pen portraits of Settler, Prospector and Pioneer VMs. Behind the simplified picture in a ‘values map’ on a 1000 x 1000 grid of data. Here’s the UK version showing the 100 statistically strongest ‘Attributes’ located by a dot placed at its point of maximum espousal (agreement with the test statements). There’s lots more you can do with this. 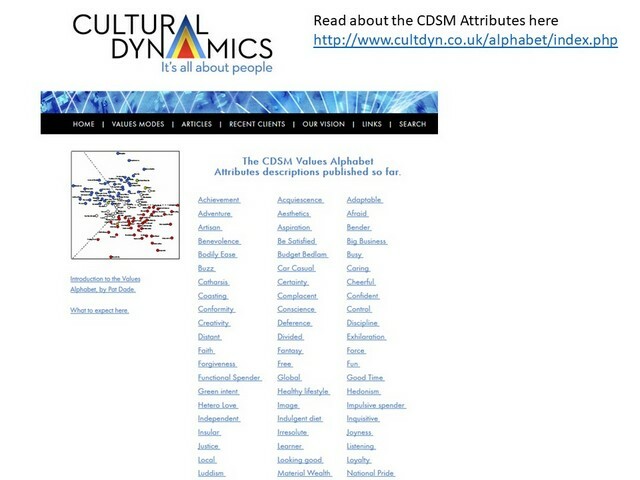 CDSM is gradually explaining each Attribute in postings at it’s website in the ‘Values Alphabet‘. 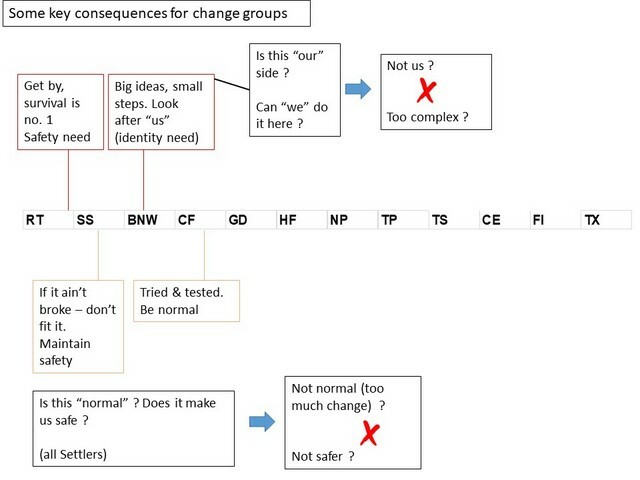 The Maslow Groups (and VMs) respond in distinct and predictable ways to different cues, eg to change and questions. A designer familiar with the system came up with the box analogy to express their latent tendencies: get back to the centre, explore the boundaries, get beyond them. 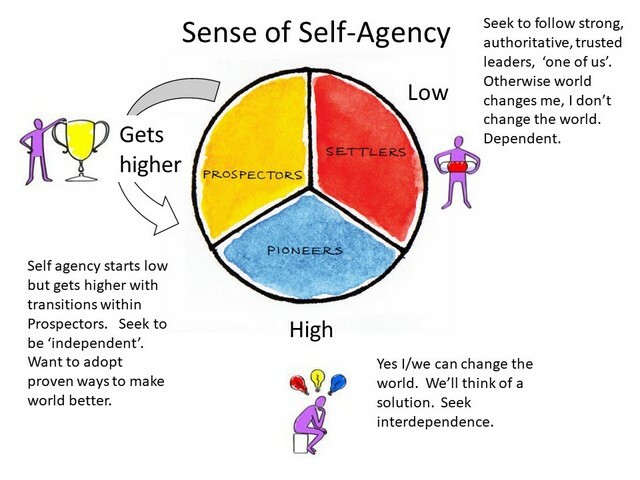 Here’s where it starts to relate to change campaigns: the differences in self-agency. (There are differences within the VMs but this is the overall picture). Different default attitudes to time. The cumulative effect of life experiences, causing transitions. A previous blog on strategy making with the basic values dynamics. 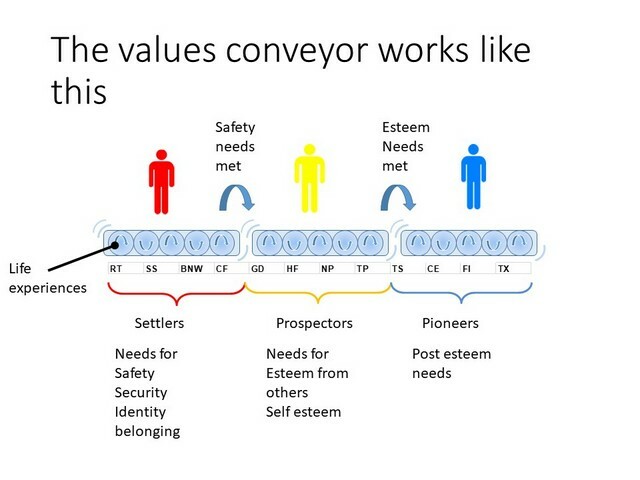 Above: the “values conveyor”. 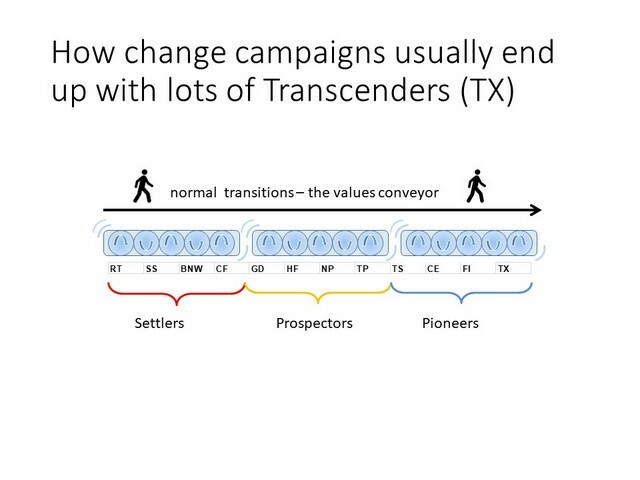 TX Transcenders are, in this model, ‘at the end of the line’. How we think it works. Self-agency. (Not the only factor in determining engagement of course but a huge one). 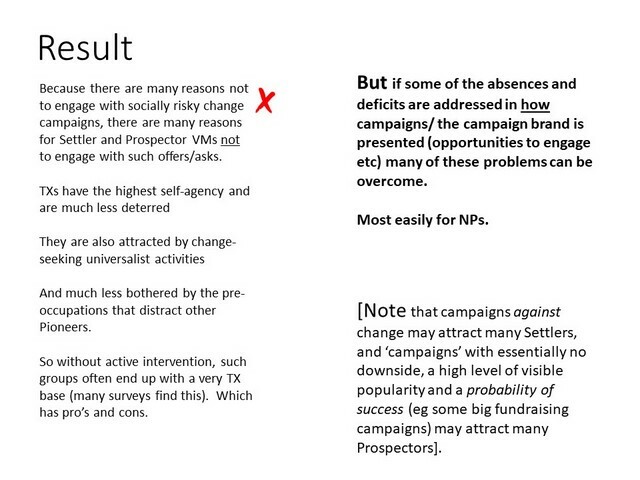 Summary of how a challenging change campaign – challenging in social terms – is subconciously processed. 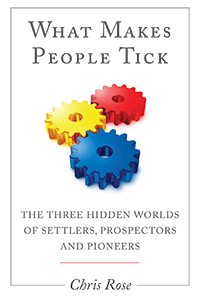 Settlers are change averse. Prospectors are success seeking and failure averse. 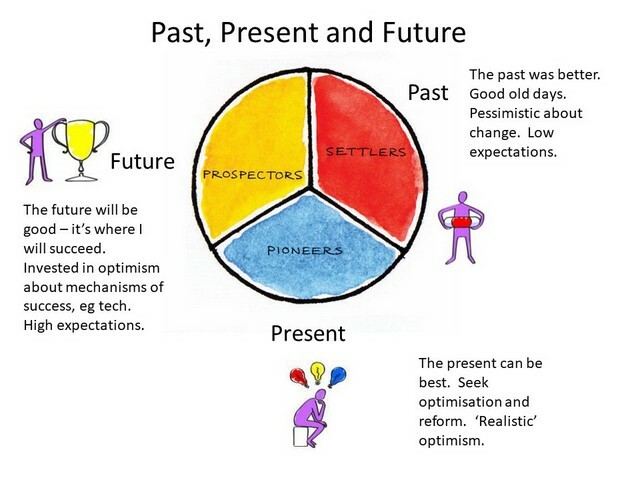 Pioneers fret about whether there’s a better option. All can be reasons not to engage, or to question and seek reassurance or proof. Now for the effects on VMs. 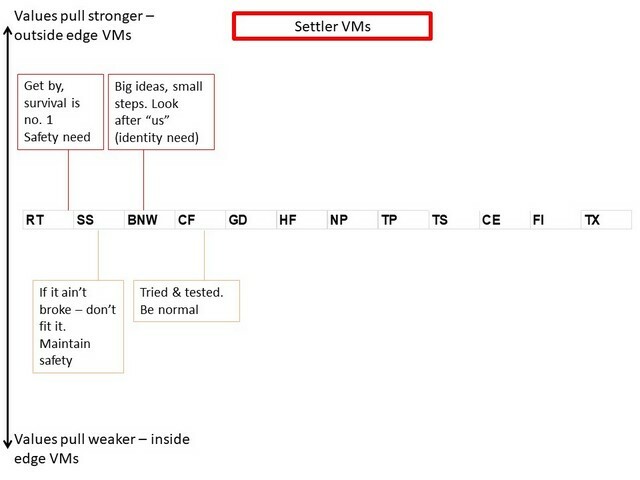 Above: basic Settler VM orientations or priorities. Defaults if you like. Same for Prospectors but different of course. (In all cases, the inside edge VMs have weaker values pulls and in general are therefore less responsive to campaigns, for or against – they are less ‘bothered’ people). And the Pioneers. 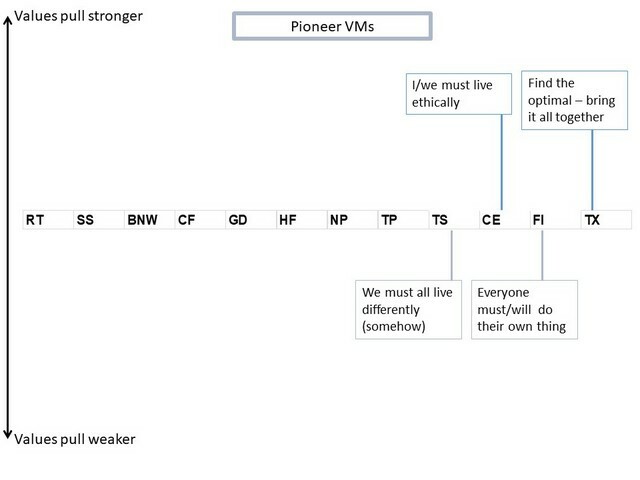 Internal debates in Pioneer-dominated campaigns are often around these different world views. 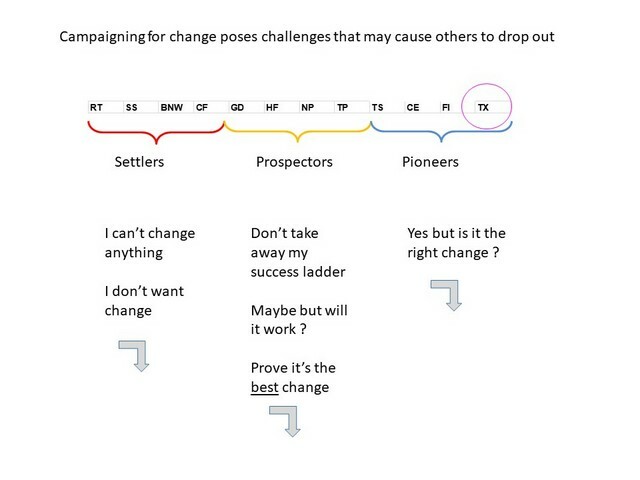 Reasons for Settlers not to feel they want to engage in a campaign ask or offer which is about big change. (Such campaigns are of course mostly cooked up by Pioneers). 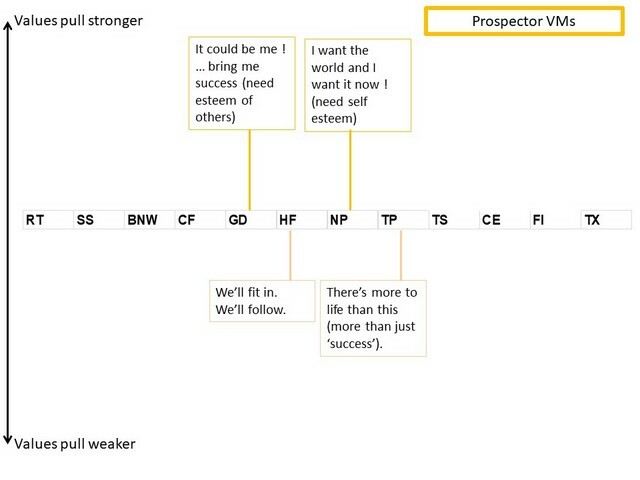 Prospector reasons not to engage. (Flip these of course and you can get a different result but that requires redesigning the format of the campaign). And the same but in Pioneer world. Typically for Pioneers they will often approve of the idea ‘behind’ a change campaign but one of these reasons may lead them not to engage. 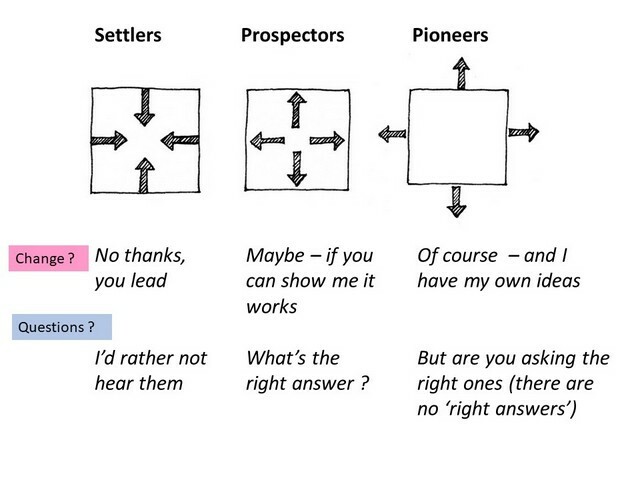 Which is why you often get much higher Pioneer ‘opinion’ support than Pioneer mobilisation or engagement. Very annoying people. So by default, you are often left with a lot of TX Transcenders. Downsides include them tending to massively over-estimate the self-agency of others, especially if they spend nearly all their time with one another! (Values bubbles). 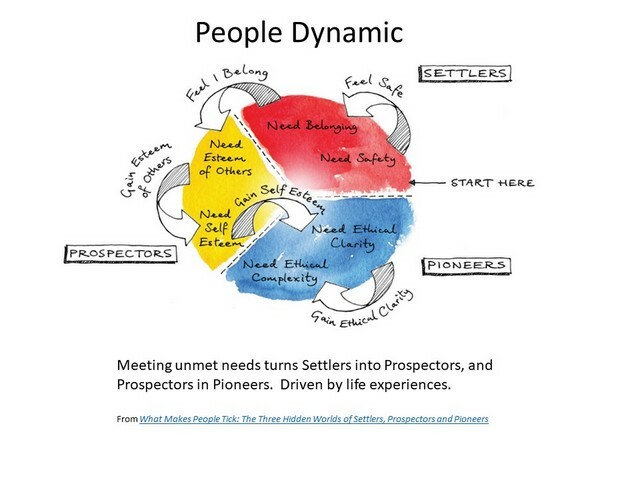 Upsides include them having the potential to engage Prospectors (especially Now People) more easily than the other Pioneers can, and Settlers. Which is one reason why they are often over-represented among those running organizations. Plus of course they think almost any problem is soluble. And there are campaigns which by dint of their objectives and format, are dominated by Settlers or Prospectors. It perhaps hardly needs saying that to get effective change, campaigns need to engage and involve a wide range of MGs and VMs. 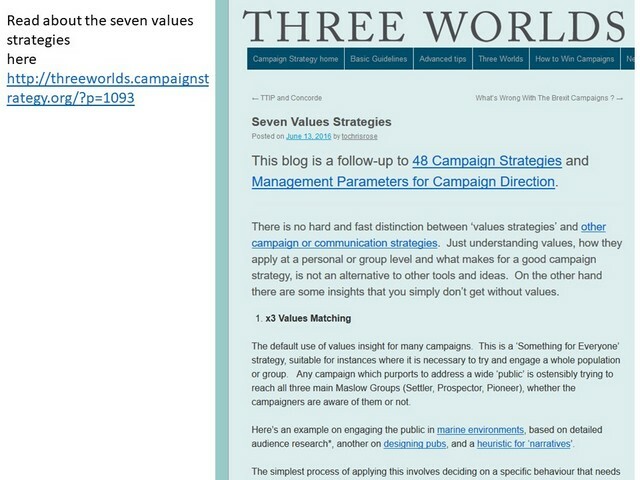 Some generic examples of ways to engage different VMs (shown on a values map overlaying Schwartz space) – more at link. 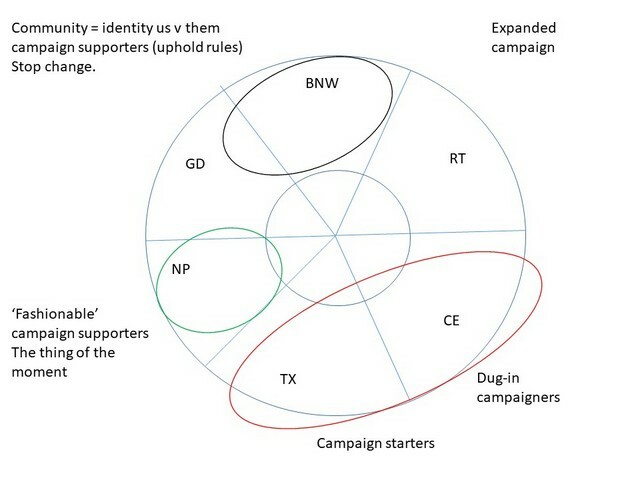 Diagrammatic campaign ‘cases’. TX tend to be the ones to start campaigns. CE Concerned Ethicals may persist with them for a long time even if nobody else much is. NP Now people are the boosters, making them ‘bigger and better’ providing they are not too dull, complex, earnest or impossible looking. 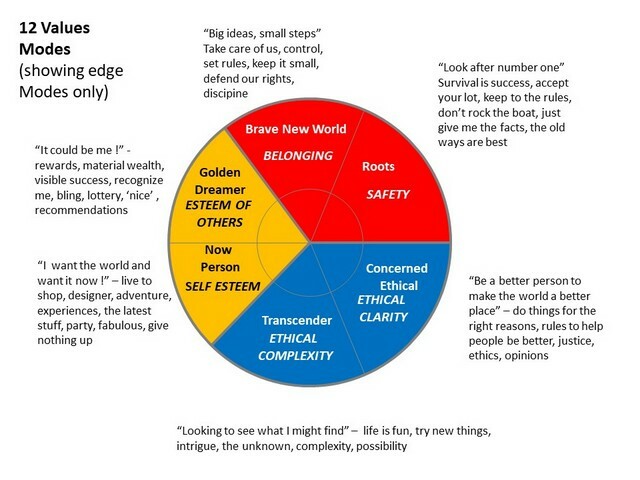 BNWs, Settler Brave New Worlds often lead or empower campaigns against change and in defence of identity and norms.